Billy Hayes in Riding the Midnight Express. BOTTOM LINE: The horrifying story of Hayes' imprisonment in a Turkish jail – and his eventual escape – is told with wit, humor, and candor. 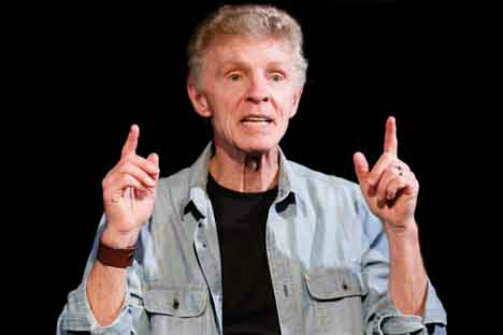 In the opening scene of Riding the Midnight Express with Billy Hayes, the now 67-year-old actor/playwright confesses that he went to Turkey hoping to "experience life" so he could write about it. It was 1969. As he explored Istanbul, a city once known as The Seat of the Throne, he found minarets, narrow cobbled streets, glistening light...and an abundance of hashish. He loved it all. Then, as the end of his adventure approached, temptation knocked and he crafted a plaster leg cast to cover several kilos of hash, boarded a plane, and returned home. This, of course, was long before airport scanners and pat downs. In fact, it was so easy that Hayes repeated his small-scale smuggling operation three more times over the next few months. Easy-peasy, he thought. Then, in an instant, everything changed. Shortly after the Palestine Liberation Organization (PLO) set off a bomb on Swissair Flight 330 in February, 1970, Turkish police officers announced that they were going to search everyone before allowing them to get on the flight. This time, Hayes had several kilos – slightly more than four pounds – taped to his skin and in his boots. "It's so surreal I just have to smile," Hayes shrugs. At the same time, it was harrowing, and Hayes still sounds incredulous as he explains that the sweep coincided with the then brand-new War on Drugs, an international campaign that increased the penalties for all narcotic-related offenses in many countries of the world. In short order, Hayes found himself in a gloomy, grimy prison, alongside dozens of other international inmates. His sentence: four years and two months. While Hayes makes clear that he was never abused by Turkish authorities – in fact, he says that the guards were unfailingly decent – he notes that bribes were expected. What's more, rules were strictly enforced, the food was awful, and restrictions were abundant. Survival was a constant test, but Hayes credits the daily practice of yoga with keeping him sane – at least until 54 days before his release date when he learned that his original sentence had been re-evaluated by the High Court in Ankara. The new penalty? Life in prison. For Hayes, who had spent the previous four years dreaming of freedom, there was little left to lose and he found himself careening into escape mode. His father got money to him – hidden in the binding of a family photo album – and after a transfer to Imrali Prison, 17 miles from the mainland, he began planning his get-away. On October 2, 1975, during a raging rain storm, Hayes stole a dinghy and rowed to safety. His mantra: "If they catch me they beat me; if I get out, I'm free." It's a miraculous and dramatic story and Hayes has told it many, many times over the past decades. His memoir, Midnight Express, came out in 1976; it was subsequently adapted into an acclaimed 1978 film written by Oliver Stone. In the current rendition (which opens off Broadway exactly 39 years after Hayes' daring escape), Hayes is seated on a prop-less stage, and his incredulity and anger seem fresh, even palpable. "Prison was both the worst and best thing that ever happened to me," Hayes says near the end of the play. "My mom always said that God protects saints and fools." It's a winning moment, and despite the folly of Hayes' youthful escapade, his gratitude is contagious and the audience can't help but share in his enormous and heartfelt relief.